Europe: Central, E and N Europe, westwards from Italy and southwards from S. Sweden; originally thought to be widespread throughout the British Isles, particularly near the coast where it can be confused with C. kewi. The latter can be distinguished from C. tetrachelatus by the possession of four (usually) posterior marginal setae on the cephalothorax. However, as noted by Legg (1987) there is considerable variation in this character between and within populations. C. tetrachelatus, sensu strictus, occurs under stones and rocks, in leaf litter and decaying vegetation. It is also asso ciated with synanthropic habitats such as greenhouses, old established gardens, quarries and waste ground. 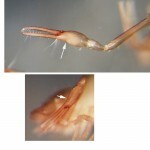 Pedipalp of tetrachelatus showing ‘dimple’ characteristic of the sub-genus Ephippiochthonius. This is also present in C. (E.) kewi.